What is a Monsterballvise ? What is a positioning system? What is the size of Floor model? What is the size of the Bench model? How does the Floor model operate? How does the Bench model operate? Is any special care needed? Why is the Monsterballvise a good idea and why do I need one? Monsterballvise was originally designed as a rugged holding and positioning system for making the larger instruments of the violin family, such as cello and base. As it has been discovered by others and since almost anything can be mounted on it for holding work, demand has led to commercial production of the Floor and Bench models. Monsterballvise combines holding and moving of the project being worked on from its former location to a new angle or attitude. By allowing the project to be rotated horizontally and perpendicularly the best position can be found for the work being performed. "Positioning", in the case of Monsterballvise products, means to locate any held object in a plane anywhere from horizontal to fully perpendicular by selecting that location or position and then locking it into that selected position for work or observation. There are currently two models in production. A floor model and a bench top model. The top of both models and the ball and work plate are the same size. The attachment plate at the top of the Monsterballvise is designed to have a project directly attached to it. Additionally, in many applications, a holding device and clamping mechanism which will hold the workpiece or project must be first attached to the attachment plate. A machinist's vise could be bolted to the attachment plate which would then grip the items which need to be held in various positions for welding or grinding. Any vise or clamping fixture could be mounted for the project to be held by it. A small workbench could also be bolted to the attachment plate which could include a small vise and other holding features. Thus, you can put nearly any project or workpiece on a Monsterballvise . Only your imagination can limit its uses. The Monsterballvise will support a great deal of weight. The more important question is what kind of load can the operator control when the Monsterballvise is released. We do not recommend a load larger than a person can hold, so as to successfully control it upon releasing the positioning grip. Over 50 pounds (22.7 Kg) should be handled with assistance and if loaded over 100 pounds (45.4 Kg), mechanical assistance should be employed lifting and repositioning a project. As with any vise, control of the load is needed when the positioning grip is released. The Monsterballvise main structure is heavily built of 1/2" steel, machined, welded and powder coated. The top attachment plate is 1/2" thick steel welded to a solid 2" diameter steel stem which emanates from the top of the ball. The attachment plate, which is pre drilled with a four hole square pattern, can be drilled to accept any bolt pattern. The ball is molded to the lower end of the stem. The lower end of the stem, which is buried in the center of the ball, is made with a welded cross piece to prevent any torque created slippage of the stem within the ball. What is the size of the Floor model? The Floor model weighs 185 pounds. The floor base plate measures 18 inches square with a hole in each corner for attachment to a cart or the floor. It has a height of approximately 28 inches with the plate down. The Bench model weighs 75 pounds (37.5 Kg). The base for the unit measures 12 inches square (30.5 cm). There are mounting holes in the back corners of the base and holes in the front that are slightly inset to allow mounting to clear the edge of a bench. Height will range from 12 inches (30.5 cm) with the attachment plate in the top dead center position to 9 inches (23 cm) with the attachment plate tipped fully down. As originally developed the concept was to allow access all around a large bulky object. With an oversize project, hands free, foot pedal operated clamping was designed to allow both hands to control the repositioning of the object. Requests were made for a positioning system that was smaller for tighter spaces without a lot of floor space. The Bench model requires special accommodation for ideal usage to allow the held project to drop down into a perpendicular position, if that is desired. A sturdy "shelf" or peninsula type of location for mounting the Bench model would create advantageous access to fully utilize its versatility. The Floor model applies gripping pressure to the ball with a pedal operated hydraulic jack. 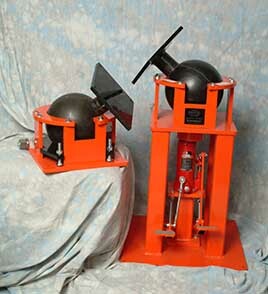 With two pedals, one for applying gripping pressure and the other to release the pressure, both hands are free for controlling and positioning the object being worked on. Stepping on the left pedal releases the gripping pressure. To tighten the gripping pressure, 3 or 4 quick pumps on the right pedal will lock in the selected position. A 6 ton (5,455 Kg) hydraulic jack was installed, not just for the force it can generate, but also for its range of motion to accommodate a larger range of possible heights. The Bench model has a clamping mechanism that is activated by a lever. The lever can be attached to either side and at any angle. This gives the best access to the lever which only requires a quarter turn to apply or release the clamping mechanism. The ball is made of injection molded plastic. The ball is cast around the stem of the upper attachment plate. The 2 inch solid steel rod which makes the stem has a welded cross piece near the end which is inside the ball to prevent torque related forces twisting the stem within the ball. The main components of the Monsterballvise are powder coated steel, which makes a very durable finish, able to stand up well to most wear and tear. A minimal amount of maintenance will enable your Monsterballvise to function at its best. Since the ball is sliding on several surfaces, it should be kept clean and free of dust and waste particles from work to keep it moving smoothly and easily. Pedals and levers should be kept clean so they are not slippery. An "apron" is included in your purchase of a Monsterballvise to shield the ball from dust or work scraps. For welding applications an "apron" of suitable material is available to prevent welding spatter from hitting the ball.. Comments made by our clients indicate that secure, infinite positioning saves time, hence money. For welding or installing fasteners, we were told they do not have to try to work at disadvantageous or uncomfortable, or even unsafe angles. One client has found that with the support of Monsterballvise , they are able to position work projects with only one person for the task required, instead of two, with the second holding the workpiece awkwardly. Thus the Monsterballvise serves as a rock solid, steady, obedient assistant. With the combination of labor savings and a reduction in defects allowed by working on the project in the correct position, they estimate they are recovering the cost of a Bench model in about one month. Thus the advantages are 1. reduced labor, 2. reduced losses from spoilage, 3. increased production, and the bonus is, 4. increased ergonomics for the worker. Please call for shipping arrangements. The Floor model usually requires truck shipping on a pallet. A Bench model is usually shipped thru a UPS store. Weight and distance will be the factors looked at by all companies in figuring the cost of shipping.